Oil on board, 11 1/2" x 15 1/2"
"On the Wild Horse Creek"
beautiful the simplest landscape is." Sven Birger Sandzen said Nature was the “great teacher”. And he himself was called, the "American Van Gogh". and how alive, vigorous and changing our trees and rocks are. The gift of understanding beauty is the greatest anyone can make to another human being." "Painting was my greatest ambition - not just to paint pictures to sell, but to understand the country about me and about its formation. When this was understood, I could paint an American landscape and show how beautiful it was to those who had not yet realized how lovely America is." Paris art critic, Guiseppe Pelletieri, wrote "This dreamer-painter is truly a master." One should . . . first of all, emphasize the rhythm and then sum up the color impression in a few large strokes. In other words: A severe decorative treatment is best adapted for this purpose." “However, it should not be understood that color is less significant. No, not at all. The color arrangement, however simple it may be, should support and enforce the lines. Sven Birger Sandzen was born Feb. 5, 1871, in Blidsberg, Sweden, to Johan Peter Sandzen and Clara Elizabeth. He was an educator and crusader for art and a great painter, illustrator, engraver, woodcut print maker and lithographer as well. with masses of paint and brightly colored, impressionist palette (Fauve). He was the son of a Lutheran minister. He showed artistic ability as early as eight years old, when he got his first watercolors and began drawings lessons. Birger Sandzen knew he wanted to be an artist from the age of 10. In 1881 he began studying at the College and Academy of Skara. While there, he studied with Olof Erlandson, a graduate of the Royal Academy in Stockholm. He graduated from Skara in 1890, then went to study at the University of Lund. After Lund University, he attended technical high school at Stockholm, studying perspective and form drawing. In 1894 he gained admission into a class in Paris taught by Aman-Jean, who also shared a studio with Georges Seurat. From Aman-Jean he learned Impressionism and Pointillism, which is seen in his work to about 1910. In 1894, he moved to Lindsborg Kansas, and his palette began to brighten considerably. then professor emeritus until his passing. and began his first year teaching in German, French, and Swedish language studies. He spoke six languages, including Latin. He felt inspired to build his home, where he resided for fifty-four years. In 1900 he wed Augusta Alfrida Leksell, a gifted pianist. They were gifted with one daughter, Margaret Elizabeth. 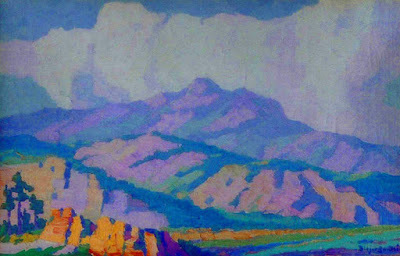 He first saw Colorado in 1908, and began painting in the Colorado Springs area about 1916. Then he found Taos, becoming a frequent visitor to Santa Fe and Taos, New Mexico beginning in 1918. He taught classes at the Broadmore Hotel and Denver College in the mid 1920s. His work won at an exhibit of Kansas City artists in 1917, and again at WCC in 1922. 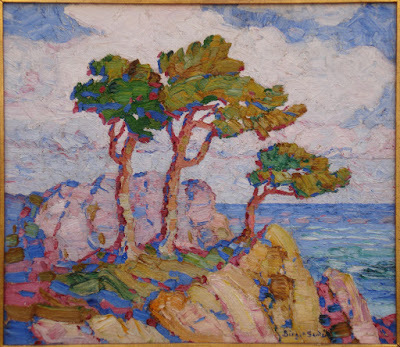 In 1922 and 1923 The Babcock Galleries in New York showed two large exhibitions of Sandzen's paintings. 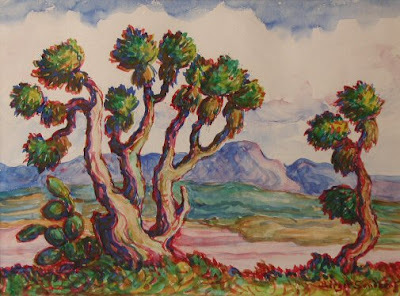 He was honored as an associate member of The Taos Society of Artists in 1922 and exhibited with the Taos Society of Artists in New York. Colorado (presently the Colorado Springs Fine Arts Center) and in the mid 1920s, he taught at the Broadmore Hotel. the University of Michigan, 188 Kansas City Art Institute, and Brigham Young University. In the 1930s he founded the Prairie Printmakers Society. He helped begin the Mid-West Art Exhibition held yearly in Lindsborg and the Smoky Hill Art Club. He also helped to organize the Prairie Water Color Painters. and for the Belleville Post Office, “Kansas Stream”, in 1939. In 1940 he was honored as a Knight of the Swedish Order of the North Star. In 1954 at age 83, Birger Sandzen died in Lindsborg, Kansas. Parsons does not offer Birger Sandzen art prints, because they can not compare to the real Art Works. Parsons invites you to visit the Galleries to experience firsthand the unmatched beauty of the real art. Sandzen arrived in Taos in 1918. He was made a member of the Taos society of Artists in 1922. Throughout his life, Sandzen exhibited extensively in Sweden and throughout the United States. He produced more than 3,000 original works over the course of his life; when print editions are included, that number jumps to over 33,000.
its rugged, primitive grandeur, its picturesque people, its scintillating light and mystic color. The spell of this fairyland is quite irresistible. Once under its magic influence, the artist will hardly be able to break away, even if he cared to do so."